Having moved from a local tribunal application form to the appeal form, we get a very different insight into the specifics of the case. The National Archives published this piece as part of their series of First World War Military Service Tribunal posts, and it looks at a cricketing-themed case. Manchester United had been invited by Glentoran FC to play a match at the Oval to promote the Ulster '71 Festival. Dorking’s street football probably had its origins in the Catholic Lenten festivals that took place all over England before the Reformation. On the morning of Shrove Tuesday shopkeepers barricaded their premises and children were given the day off school. Cricket was born in Surrey, Sussex and Kent. The first recorded local game was at Mickleham Downs in 1730. By the 1760s it was well established on the Cotmandene. Those of you sports nuts who know all about Opta, ProZone and match analytics may find it hard to believe but once upon a time there was no computer analysis of sports matches. The first president of the new club was Lord Willoughby de Broke, who also played in a number of the early fixtures. The World Cup of 2014 triggered an outbreak of football fever amongst some of the staff at the museum. 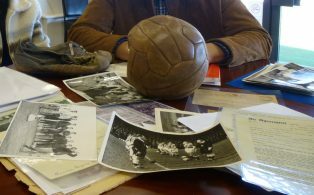 With perfect timing, the museum archives had just catalogued a treasure trove of sporting memorabilia relating to the museum’s very own sports clubs.